At the height of the global economic crisis in 2009, the Kingdom of Bahrain witnessed a downturn in the real estate market, which has created a lot of stalled real estate projects in many areas in Bahrain. Over the past couple of years, the government has been putting a great effort to solve that issue and revive stalled real estate projects. On 6 December 2014 the Legislative Decree No. 66 of 2014 came to settle the stalled real estate projects problem. Since then, many projects saw the light of day and resurrected once again, whereas many are still waiting their turn to get settled and move on. Here we give you a list of the stalled real estate projects that got revived and the ones that are standing still with no progress whatsoever. 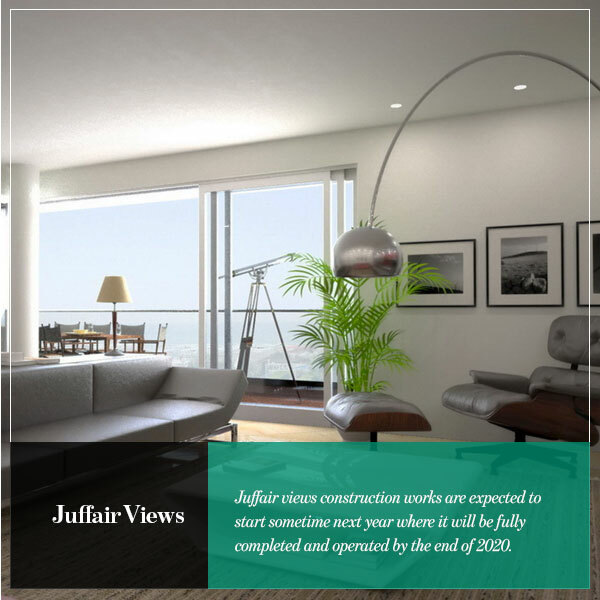 Located in the northern Juffair area, Juffair Views is a partly completed residential building that was sold at a public auction to the Indian hospitality firm, Ramee Group for 9.48 million dollars. The project was launched in 2006 and got stalled in 2009 at the time of the global economic crisis. It is worth mentioning that the project is almost 70% complete. Ramee Group’s intention is to redesign the whole project which will be a luxurious hotel apartment development that comprises of 120 suites, restaurants, spa, health club and outdoor swimming pool. Juffair views construction works are expected to start sometime next year where it will be fully completed and operated by the end of 2020. 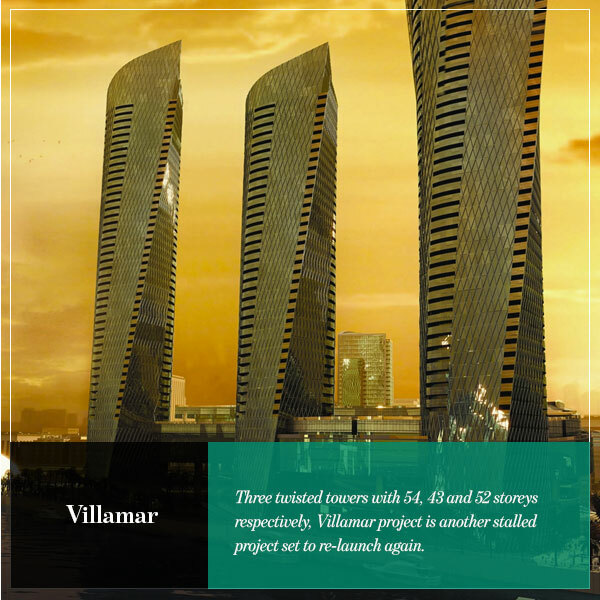 Three twisted towers with 54, 43 and 52 storeys respectively, Villamar project is another stalled project set to re-launch again. Villamar is located on its own island within the Bahrain Financial Harbour. The project launched in 2006, however, it faced a series of delays in 2009, 2011 and 2012. However, Villamar’s developer Gulf Holding Company has restructured a final Sukuk with financier Al Rajhi Bank and sponsors the GFH Financial Group to restart working on the project once again. A world class development, the project includes floating sky villas as well as the terraced podium housing that features 437 apartments, 52 villas and 16 penthouses. That’s not all as the project also encompasses a health club, spa, swimming pool, restaurants and cafes. Following a five-year delay, construction works on Landmark Cityview tower were resumed in the last quarter of 2016. The project is expected to be completed by September 2017. 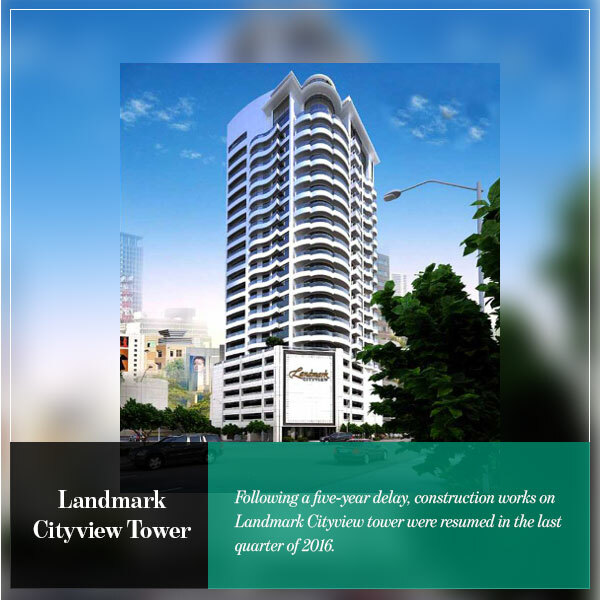 Landmark Cityview Tower was launched on 2009 and got delayed in 2011. It is worth noting that the project is a joint venture between Ithmaar Bank and Ebrahim Abdulaal Al Fahad Group. Located in Seef district, the project comprises of five-storeys commercial towers and an additional 20 floors that include residential units of one, two and three bedrooms. With a value of 700 million dollars, Marina West is located on Bahrain’s West Coast. The project was initially launched in 2007 and was scheduled for completion in 2010. The project is now is in the bidding process where Bahrain’s Committee for Stalled Real Estate Projects is in the process of reviewing eligible developers to complete the construction works. 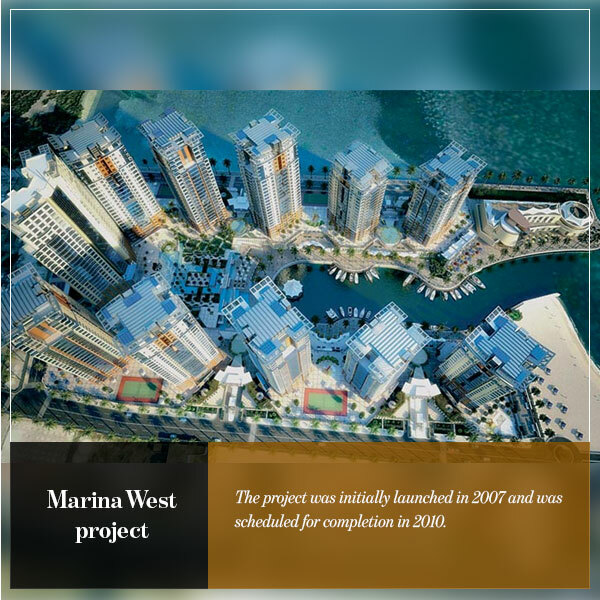 Marina West is considered the largest stalled real estate project in the Kingdom of Bahrain. The mixed-used project comprises of 10 residential towers that feature apartments, duplexes, simplexes, penthouse suites. An eleventh tower is also expected to be constructed and will feature a five-star hotel. Marina West is one project that provides high-rise residential towers with a wide array of amenities such as health club, retail outlets, swimming pools, private beach, tennis courts and more. 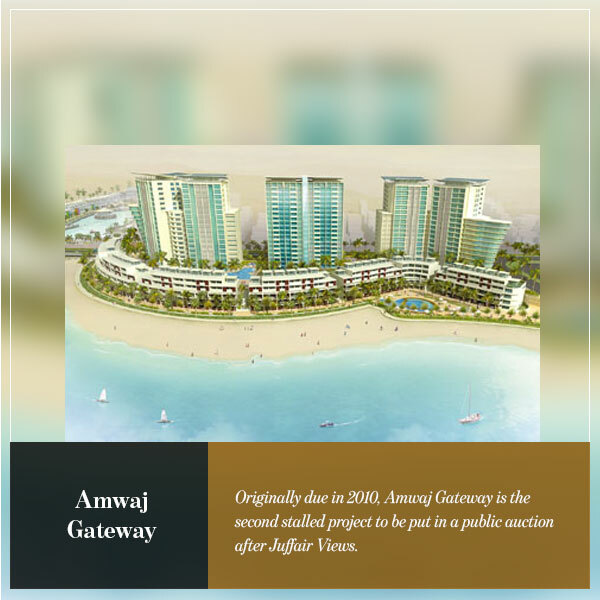 Originally due in 2010, Amwaj Gateway is the second stalled project to be put in a public auction after Juffair Views. Amwai Gateway is a mixed-used project located near Amwaj Island entrance. The project comprises of retail and commercial units, seaside houses, two condominiums and a hotel. It is worth mentioning that the Bahrain’s Committee for Stalled Real Estate Projects has rejected the two offers by Mina Investment Company and UXB unanimously. 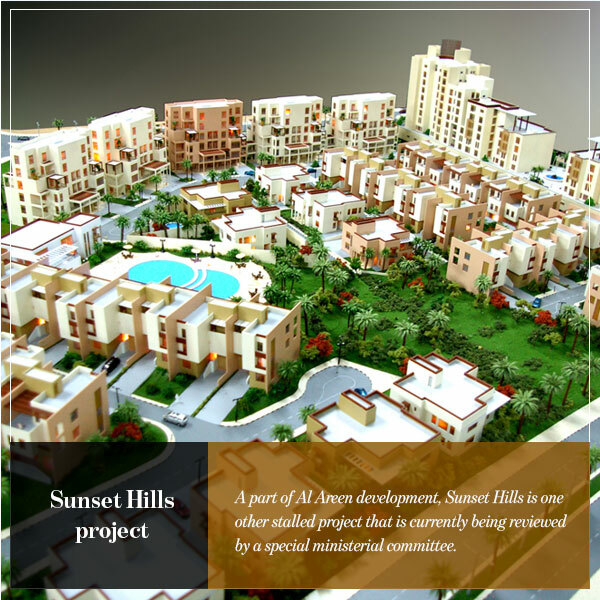 A part of Al Areen development, Sunset Hills is one other stalled project that is currently being reviewed by a special ministerial committee. Sunset Hills was launched in 2007 and was scheduled for completion in 2009. It is worth mentioning that the project occupies over 40,000 square meters in Al Areen development. The multi-million-dinar project is located on the edge of the desert at Sakhir, Bahrain. The mixed-used project comprises of villas, townhouses, apartments and a retail outlet.